You can get your green tea fix in a 33-ounce tumbler covered with a Large Kup Kollar called Lavender Hawaii. 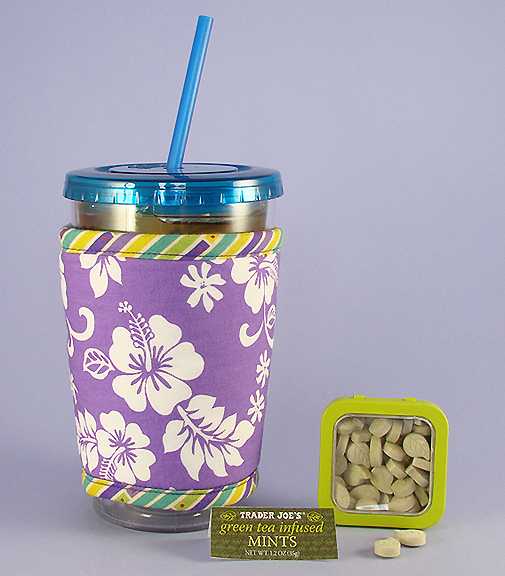 The cup wrap is designed with fabric I bought in Hawaii on a trip to learn about tea farms. Or you can get your tea fix with a colorful tin full of Trader Joe’s Green Tea infused Mints. These mints aren’t flavored but infused with matcha green tea grown on single-estate tea farms in Japan. Green tea extract, pure peppermint oil, cane sugar, and honey are added to the finely milled green tea powder to make these lovely mints. I love the subtle taste, which isn’t overly sweet. The mints don’t leave an aftertaste in your mouth. I keep my tin next to my computer for a splash of minty antitoxins the first time I sit at my keyboard!